Polished black marble tablet with dedicatory inscription, gilded lettering, text in both English and Chinese. 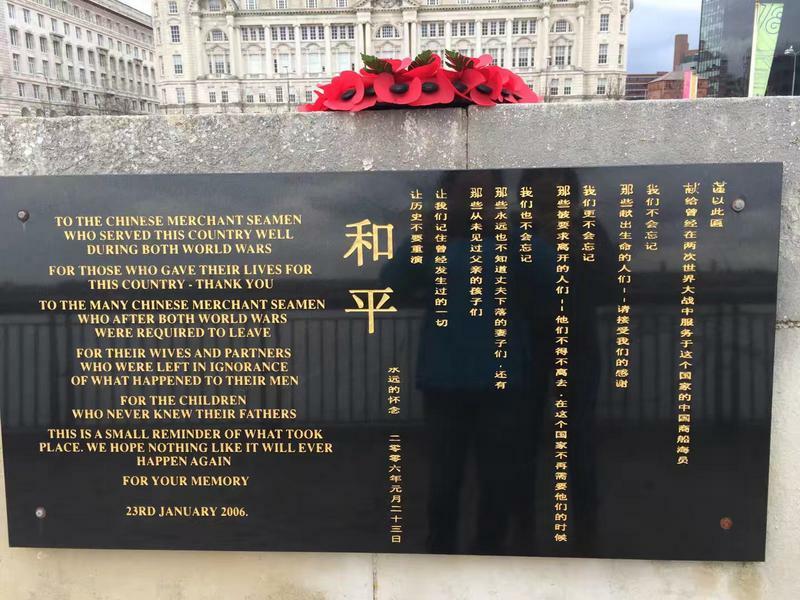 TO THE CHINESE MERCHANT SEAMEN/ WHO SERVED THIS COUNTRY WELL/ DURING BOTH WORLD WARS/ FOR THOSE WHO GAVE THEIR LIVES FOR/ THIS COUNTRY - THANK YOU/ TO THE MANY CHINESE MERCHANT SEAMEN/ WHO AFTER BOTH WORLD WARS/ WERE REQUIRED TO LEAVE/ FOR THEIR WIVES AND PARTNERS/ WHO WERE LEFT IN IGNORANCE/ OF WHAT HAPPENED TO THEIR MEN/ FOR THE CHILDREN/ WHO NEVER KNEW THEIR FATHERS/ THIS IS A SMALL REMINDER OF WHAT TOOK/ PLACE. 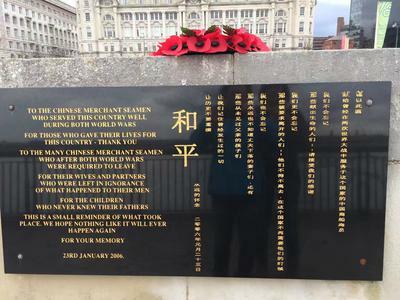 WE HOPE NOTHING LIKE IT WILL EVER/ HAPPEN AGAIN/ FOR YOUR MEMORY/ 23RD JANUARY 2006 (Note: This is only part of the inscription, the rest is a form of protest written in Chinese lettering).